I never heard of a mobile broadband (MiFi). I didn’t know the office had one either, but it sure was a lifesaver for our MPD trip! Also, I had just started the blog tour for e4e and needed to blog several times during our ten-day trip. However, it looked like we would not have internet service for nine days. So, I started to write and schedule my blogs to publish while we were travelling when Mike came home with a MiFi device, a portable hot spot. You can see it’s smaller than a deck of cards. So, I was able to check email and blog a bit, while keeping the blog tour on schedule. I had been working hard to get ready for a trip that I thought would have no internet at all and ended up having wireless! I had no idea! Our office bought this device and the monthly service for our supported staff to use on MPD trips. Having this wireless device really worked well for us because I schedule most of the appointments for our MPD trips using email. We had not heard back from everyone before we left on this trip, so it was a great help to be able to check for emails from donors while on the road. Maybe this device would be an asset for your team for MPD trips or if your team does a lot of travelling. 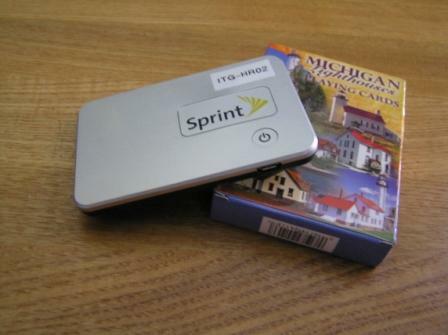 Check Wikipedia under “MiFi” for more information.